I have 2 new articles in The Japan Times this month. 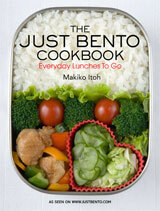 The first one is my regular monthly Japanese Kitchen column. This time it's about eggs in Japan, the propensity for eating them raw or barely cooked -- and why that's generally safe. 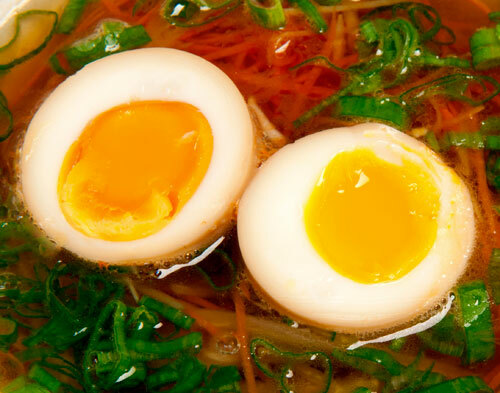 The recipe is for the delicious soft-boiled eggs that are often included in ramen, called ni-tamago or aji-tamago (or ajitsuke-tamago). They are very easy to make -- you just need to soft-boil them to the stage you like, and peel them carefully. Then you just marinate them for a day or so. Check it out! Correction: The recipe refers to sugar, but you don't need any sugar (the mirin adds enough sweetness). If you don't have any mirin you can use about a tablespoon of sugar in the marinade instead (but I recommend using mirin over sugar, since it adds a richer flavor; you could add honey or maple syrup instead for a different dimension). My apologies for the error! The second article was for a special pullout section issued for the Summer Davos conference held by the World Economic Forum. It's about the history of ranking restaurants and other eating places, food, and related things in Japan -- they were already doing it in the Edo period in the 18th century. This article was really fun to research and write. I especially liked the anecdote about the poor samurai in the 19th century who had to apologize profusely for serving a cheaper sweet to his guests than the top-ranking one that was de rigueur at the time. There's also an image of a board game played with dice (sugoroku) that lists many famous eateries and food shop of Edo in the 1850s. You can see an image of a ryouri-ya banzuke or restaurant ranking from 1852 on this page. The restaurants are arbitrarily divided into "East" and "West" teams and given sumo rankings. Submitted by maki on 2014-09-18 15:12. I liked your article on Japanese eggs very much. I think I'll cook up some nitamago for lunch, as I like my yolks runny. Not many people around here eat runny yolks either, mostly I think because of a salmonella scare over some years. As I eas a child everybody had eggs wiht runny yolks, even eating rwa yolks on their food, but now not so much. I have tried eating raw whites as well, but dod not like it. 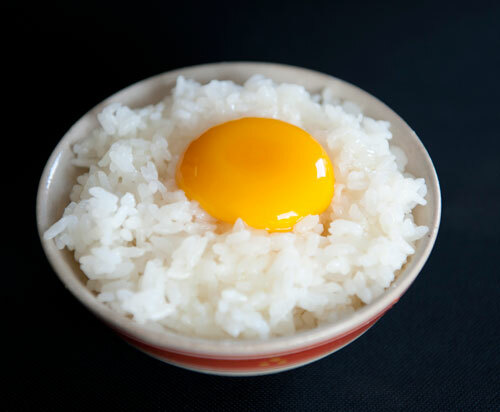 Do the egg in tamagokake-gohan become sligthly boiled when added to the hot rice, or are they still totally raw when eaten? I don't think the rice is hot enough to cook the eggs a whole lot, although if it's very hot the eggs might thicken a bit. Yeah I love runny eggs yolks as well! you know for your friends that are scared of salmonella you can use pasteurized eggs which have no salmonella and can be runny. If you have trouble finding pasteurized eggs in your local grocery market you can pasteurize them your self in a immersion circulator (sous-vide) at 55ºc for 2 hours. I looooove ni-tamago! I once was obsessed with them and spent a few days trying out different boiling/simmering times to get them just right. Thanks for the reminder, I haven't made them in a long time. It annoys me that the government in the USA just tells people to not eat raw eggs instead of going after the egg producers to clean up their act. Dirty egg production causes salmonella not eggs themselves. Europe eats a lot of raw and semi-raw eggs too, but are more strict with food production than the USA. I just spent two weeks in Europe and the food was to die for! Of course we spent too much money on food, but hey we were on vacation. Interestingly I have pretty bad heartburn (GERD) and some arthritis. The whole time I was in Europe I had only two bouts of heartburn,(compared to once or twice a day at home, and that's with medication) and my arthritis didn't flair up at all. It all came back within one day of being home in the USA. What are you doing to your food America!?!? Btw, good to see you back again! Hope you're feeling better. No arthritis in Europe -- gluten? If European food helped your arthritis and a digestive-tract issue that you encounter in America, you might want to look into whether you have issues with gluten. This only applies if you eat an appreciable amount of wheat-based baked goods, of course! Gluten triggers inflammatory reactions in my joints and digestive tract (not GERD, but that involves inflammatoin, too); maybe that's happening for you. My understanding is that European baked goods often have less gluten than American. Apparently, traditional flours usually have less gluten than modern bread flour, and also some traditional bread-making methods, such as the "sponge" method, break down gluten. This was explained to me by a baker in the U.S. who baked wheat bread that ended up very low in gluten. I have friends who've learned to avoid wheat products in the US to prevent various symptoms and who have "cheated" while traveling in Europe without problems -- eating wheat without symptoms. I have no idea whether gluten is really a problem for you, but I thought I'd mention the possibility. If you're like me, small amounts of gluten won't be a problem, so you can eat at Asian restaurants without worrying about the wheat in the soy sauce. Re: No arthritis in Europe -- gluten? Thanks for the info. I was actually thinking gluten could be part of the problem, except that I ate a fair amount of delicious European bread, but if their flour is lower in gluten that could be it. I've been avoiding gluten since I got back and I do feel better. I had a couple cookies yesterday, and last night my nose and eyes were itchy and I was stuffed up, and this morning my arthritis in my fingers was stiff and a little painful, so I think we may be onto something. Maki, sorry for hijacking your comments. The main difference between eggs in the US and Europe is that in the US, eggs are strongly cleaned at the producer, so they need to be kept refrigerated in shops and at home. In Europe, eggs are kept at room temperature and washed before use. I don't know which way in Japan. The US not eating raw eggs thing is mostly a US liability/ paranoia thing, I think. They have little signs on restaurant menus about it being dangerous to eat rare meat and fish, too. I enjoyed the article about restaurant and food ranking. I didn't know that food blogging in Japan had been around for so long. Your recipe for ni-tamago appears to have left off the sugar from the list of ingredients. Your instructions refer to sugar. Would it be about 100 g? Also, instead of using the seasoning packets in instant ramen or a bouillon cube (which are mostly salt and chemicals), why not use chicken stock or dashi plus sake? Interesting article you have here. I love Japanese food, looking forward for recipes.